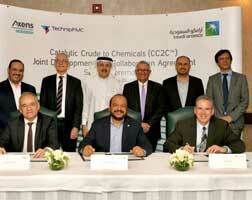 State-owned company Saudi Aramco, through its wholly-owned subsidiary Saudi Aramco Technologies, has signed an agreement with Axens and TechnipFMC to accelerate the development and commercialization of the company’s catalytic crude to chemicals (CC2C) technology. CC2C technology has the potential to significantly increase the efficiency and yield of chemicals production, converting more than 60% of a barrel of crude oil into chemicals. The agreement aims to achieve commercial readiness for the CC2C technology by 2021. The innovative CC2C technology builds on the success of the proven high-severity fluid catalytic cracking (HS-FCC) technology, which Saudi Aramco co-developed with King Fahd University of Petroleum & Minerals (KFUPM) and JXTG Nippon Oil & Energy, to directly convert crude oil to high value chemicals.